The big wheel/tire trend is width. The more, the better. 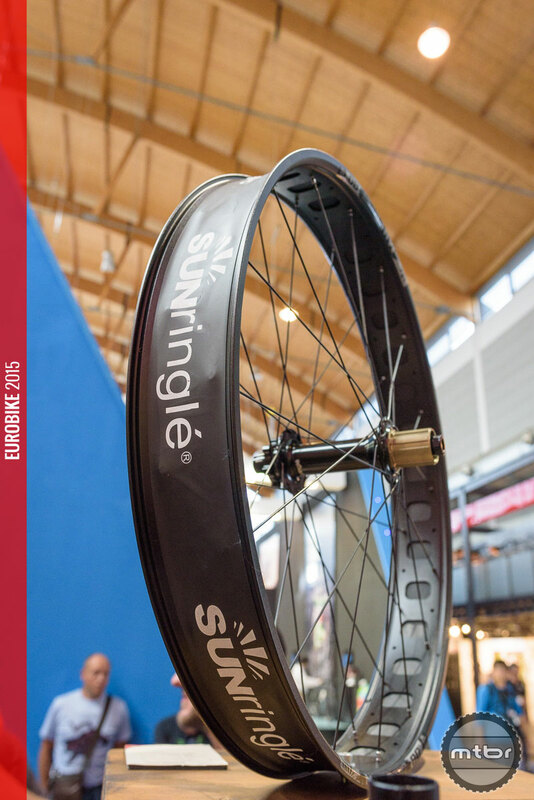 To accommodate this, SUNringlé now has put the wide Mulefüt rims together with their SRC hubs and Wheelsmith spokes. The rims that have been made famous during the growth of the oversized tire craze now have transformed into complete wheelsets. 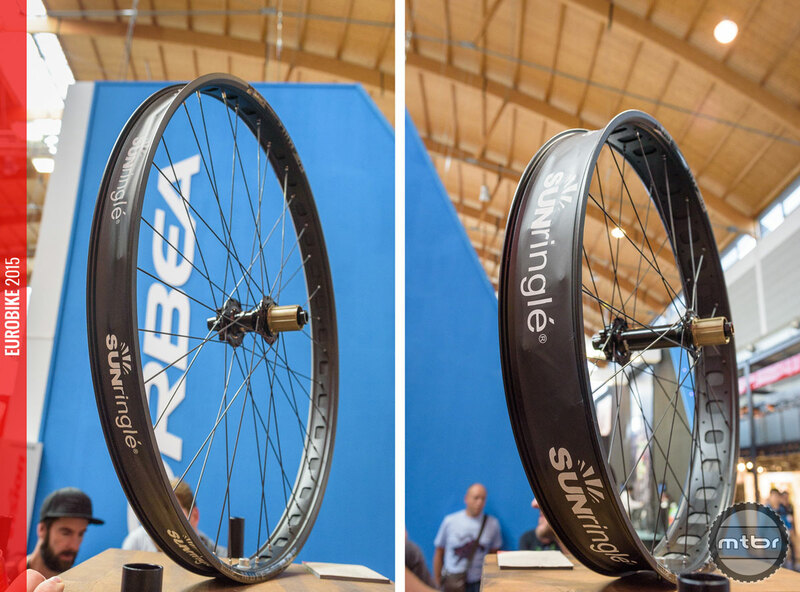 Available in 50 or 80mm width, Sunringlé offers new wheelsets for plus size or fatbikes. 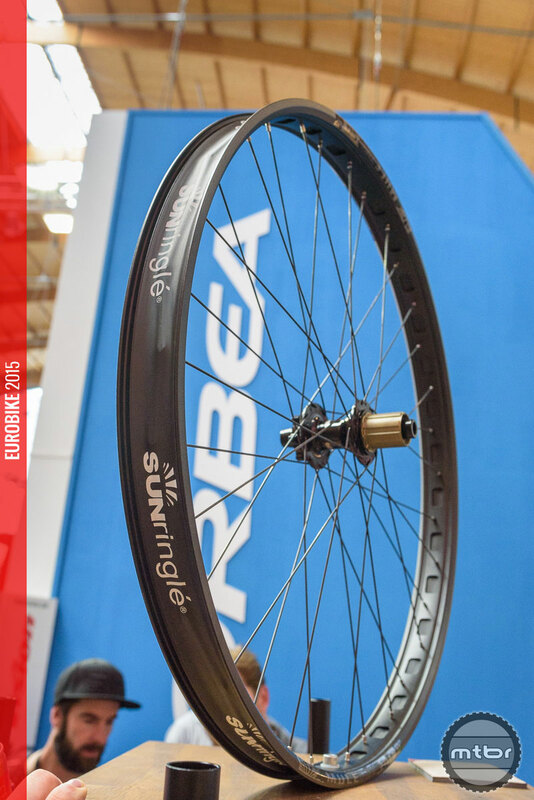 Features: lightweight durability and performance; SUNringlé Tubeless Ready (STR) – the easiest wide tire tubeless setup in the industry; the rims are laced up to SUNringlé SRC hubs with time tested Wheelsmith spokes; flange shape and diameter improves balance and spoke tension; rear axle design increases durability and reduces flex; smaller hub bearings for reduced overall weight. The Mulefüt 50 SL wheelset comes at 50mm outer width/45mm inner width and offers both 27.5” and 29” wheel sizes. The Mulefüt 80 SL comes at 80mm outer width/75mm inner width and offers 26” and 27.5” wheel sizes. Wheelsets come complete with rim strip – for an easier tubeless conversion rim tape, valves and tire sealant are included. For more details visit www.sun-ringle.com. This article is part of Mtbr’s coverage of the 2015 Eurobike trade show in Freidrichschafen, Germany. For more from Eurobike CLICK HERE. Optical illusion or not – the Mulefüt 80 SL wheelset still is quite big! At a more moderate 50mm outer width, the Mulefüt 50 SL wheelset is made for plus size tires. At a more moderate 50mm outer width, the Mulefüt 50 SL wheelset (left) is made for plus size tires. Optical illusion or not – the Mulefüt 80 SL wheelset (right) still is quite big! What is the projected MSRP for the 50ml 29er wheelset?